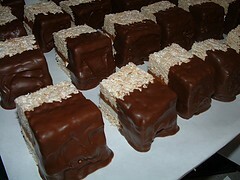 I like to Cover Rice Krispies squares to look like an ice cream bar. We made a batch of original rice krispie treats and allowed them to cool at room temperature. Then we cut them into square and inserted a wood Popsicle stick. We proceeded to melt our chocolate and began dipping but before we were done with the first one and on to the second one our marshmallow treat had melted right off the stick into a mess. I also was trying to get a smooth outside look but the chocolate just ran inside the marshmallow treat only light covering it. Do you have any help??? You said that the rice crispy treats were completely cool, so that shouldn't create the problem. I'm thinking the chocolate is too hot! Yes, you have to melt it, but you need to let it cool down a bit before dipping or spooning the chocolate onto the rice crispy treats. Another tip to help the chocolate remain smooth is to add a tsp. or two of shortening to the chocolate when melting it. Because the rice crispy treats aren't naturally smooth, be sure to press them well into the pan to get as smooth a surface as possible. Also, you may have to dip the squares twice in the chocolate in order to get a fairly smooth finish. Freeze the rice krispie treats then dip in chocolate.